The other day I wrote about Malinda Russell’s butterless Sour Cream Cake. Was buttermilk available in Mrs. Russell’s day, someone asked. Could we use it today in place of the sour cream? Buttermilk was available in Mrs. Russell’s day. Indeed, the first-known reference to it dates to a 1528 health manual that proclaimed, “Nothynge nourisheth more than” fresh “Butter mylke” “sopped up with new hotte breadde.” Mrs. Russell, however, does not use the term. Many of her recipes call for “sour milk,” which may, in fact, refer to buttermilk. (According to Joe Pastry, because of a lack of refrigeration, all milk and cream used to be somewhat sour.) Other of Mrs. Russell’s recipes use sweet milk, while still others call simply for milk. Helpful, huh? To add to the confusion, the name “buttermilk” is a misnomer since buttermilk is what’s leftover after cream has been churned into butter. That means, Joe Pastry explains, that buttermilk is low-fat. Its thick texture, and its tanginess, comes from the lactic acid bacteria in it. Because buttermilk is so low-fat, I wouldn’t use it in place of sour cream in Mrs. Russell’s cake. There’s no butter in the recipe and using naturally low-fat buttermilk in place of higher fat sour cream (which is already much lower in fat than butter) would result in a cake fairly thin in taste. So, yes, buttermilk was available in Mrs. Russell’s day and it is wonderful in cakes, though perhaps not her sour cream cake. But buttermilk can be more than a cake ingredient. It could, some thought in the late 1700s, save lives. Yes, you read right, buttermilk might prevent untimely deaths. Dr. Benjamin Rush, who we have already met reporting on the 1782 celebration for the newborn French prince, was the leading doctor in the United States. A Philadelphian, he was also active in reform movements at a uniquely fraught time. The success of Americans’ fragile experiment in republican government – in self-government, without the political or social authority of a monarch – depended on citizens’ self-restraint, many believed. It depended on citizens’ ability to put the good of the community ahead of their own good. Among the threats to the health of both individuals and the republic was excessive drinking, Dr. Rush thought, and so he urged temperance on his fellow citizens. In 1782, with the harvest approaching, Dr. Rush particularly worried about “the custom of consuming large quantities of spirituous liquors at that season.” Farm laborers who drank too much fought, used profanity, squandered their money, and sometimes suffered sudden death. All these evils could be avoided, however, by choosing “simple, healthy, and frugal drinks.” First among the beverages that Dr. Rush suggested? Buttermilk mixed with water. With all due respect to Dr. Rush, I’ll stick to using buttermilk in baking. In fact, all this talk of buttermilk makes me think that in coming days, we should explore one of Mrs. Russell’s cakes that uses sour milk. 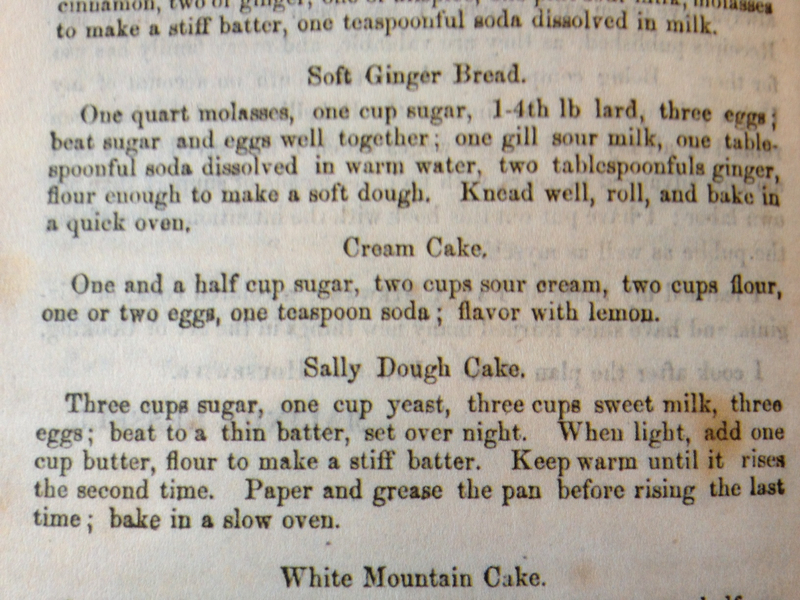 Here’s Mrs. Russell’s Cream Cake recipe. If you’re a baker, you may be thinking what I thought. “How should the ingredients be combined?” “What temp do I bake it at?” “What kind of cake pan should I use?” (If you aren’t a baker, you may be thinking, “yeah?”) Then, bakers, you may suddenly realize, “There’s no butter in the recipe” and think, “That’s weird.” That was my reaction too. Preheat the oven to 325 on convection (or 350 in a conventional, non-convection oven). Butter (generously) and flour two 9 x 5” loaf pans. Using an electric mixture, beat the sour cream for a minute or so. Lightly mix together the lemon juice and zest with the eggs. Add half the eggs-lemon mixture to the whipped cream. Beat until combined. Repeat with the other half. Gradually add the sugar and combine thoroughly. Stir together the flour and baking soda. Add the flour mixture to the sour cream mixture in two separate additions and mix only until combined. Pour into the cake pans (or pan depending on what you use). Bake until golden and a toothpick or metal cake tester comes out clean. In two 9 x 5” loaf pans, the baking time was about half an hour. *Rotate the cakes about halfway through the baking time to ensure even baking. I’d love to hear about how the recipe worked for you, especially if you did anything differently, such as combined ingredients differently or used a different cake pan. Now, if you don’t know how to bake and you’re in the DC area, the family baking class I’m teaching at the Hill Center is the place for you. The troubles between an African American cook and a famous white restaurant owner are getting a lot of attention today. “The relationship between [Dora] Charles and [Paula] Deen is a complex one, laced with history and affection, whose roots can be traced back to the antebellum South,” reports the New York Times. In its discussion of this history, the article implicitly portrays black cooks in the South as toiling for white masters and indeed many, many did. But not all. Cookshops, explains historian Ira Berlin, were the most common business among free African Americans in the antebellum South. Customers – free or enslaved – could buy groceries or snacks, enjoy a drink, or play a game of cards. Most of all, they and the shops’ owners could escape, for a time, pervasive white oversight. Malinda Russell, author of the first-known African American cookbook (published in 1866), too sought autonomy. She was born free, she is quick to tell us in her short autobiography to her book. And she kept, not a grocery, but a pastry shop that enabled the widow to save “a considerable sum of money for the support” of herself and her son. She worked hard to be her own mistress, she wants us to know. Her pursuit of independence is part of the long history behind today’s unhappy news. There is no chocolate in Malinda Russell’s 1866 A Domestic Cookbook. None. Mrs. Russell, author of the first known African American cookbook, explains that she had had a pastry shop in Tennessee for several years, and her cookbook includes dozens of recipes for cakes and cookies. But not one uses chocolate. Pastry chefs today may like chocolate well enough, but can feel that chocolate desserts are their least interesting creations, that a molten chocolate cake is obligatory. (As an avowed chocolate lover, I don’t have a problem with this obligation.) But that’s not why Mrs. Russell left chocolate out of her recently-discovered cookbook. In her day, it was still a relatively new ingredient for baking. Chocolate had been long known in the United States, but mainly as the key ingredient in a rich, hot drink. When Spaniards had arrived in what’s now Mexico, they discovered a drink made of roasted and pounded cacao beans mixed with water and often spices. (So, chocolate recipes today that use cinnamon, pepper, and other spices aren’t trendy, they’re as traditional as could be.) Europeans and Americans soon took to the beverage and in the 1600s and 1700s, they drank, not ate, chocolate. Even before chocolate came into common use as an ingredient in cakes, however, there were “chocolate cakes” – cakes meant to be eaten with hot chocolate, just as coffee cakes contain none of their namesake ingredient but make perfect accompaniments to that morning cup of joe. In the 1800s, as clever (and highly commendable) people developed new methods of processing and manufacturing chocolate, Americans increasingly added chocolate to puddings, custards, and, more gradually, cakes. Not Mrs. Russell. Check back for more on her recipes. They may surprise you. I’ve been seized by a mission to find Malinda Russell. Her Domestic Cookbook, published in 1866, was discovered about a decade ago in California and acquired by Janice Bluestein Longone, now curator of American culinary history at the University of Michigan Special Collections Library. Mrs. Russell explained in a short introduction to her recipe book that she was a free-born African American from Tennessee. She was a cook and had had her own pastry shop for a time. During the Civil War, she had to flee the South because of her “Union principles” and had wound up in Paw Paw, Michigan. With the war over, she wanted to return to her family in the South and published the cookbook to raise money to get home. Malinda Russell’s story became an obsession for Jan Longone. She logged long hours in archives in the South searching for Mrs. Russell, to no avail. In 2007, Mrs. Longone published a facsimile of the cookbook to widespread excitement among culinary historians. My generous mother-in-law sent me a copy. A former pastry chef and history grad student, I was fascinated, but busy (see: grad student). I put the cookbook on the shelf and there it sat. Recently, I took it down and started thinking about using it to do history differently — differently for me anyhow. A number of historians have been exploring the sounds of the past lately. I could work on the tastes. But I was also confident I could find out more about Malinda Russell, and pretty quickly. After all, I uncovered all sorts of great material for my dissertation and first book manuscript. Since the discovery of A Domestic Cookbook, little new has turned up about Mrs. Russell. Surely, I could find something. Well, I was wrong. Turns out it’s easier to find sources about well-known figures than about historically-marginalized people. The search for documentary evidence about my fellow pastry chef will take longer than I thought, but I’m keeping at it. Meanwhile, thanks to the recipes she left us, I – we – can discover a taste of her world. Check back later this week for one of Malinda Russell’s recipes!